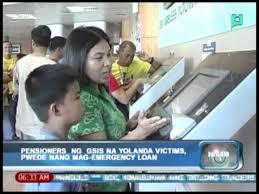 Alongside with the scheme, the GSIS will not be left in trying to help typhoon Yolanda victims as they too offer their own version of the SSS member loan. In another report by InquirerNews, it is revealed that SSS pensioners loan may be availed by qualified members with up to 3 months advance pension amount. Waiving of the processing fee for the loans are also given to those who willapply for the house repair option. Also members who have already availed of the salary loan may qualify to apply again as part of the aid to help the typhoon victims recover. a 6-month allowance for the application will also be given to the borrowers in affected areas. A member with at least 36 monthly contributions may apply for a maximum salary loan of P30,000. A member with at least 72 monthly contributions may apply for a maximum loan equivalent to twice his monthly salary credit. This entry was posted in News and tagged calamity loan, emergency loan, house repair loan, member loan, pensioner loan, sss loan for yolanda victims. Bookmark the permalink.